For the past four years, Liz Harris has played the role of Superwoman: law clerk by day, part-time law student by night, and full-time single mom to her 8-year-old daughter. The long days and nights, though, are about to pay off for Harris, who graduates on May 12 with a Juris Doctor from the University of Arkansas at Little Rock’s William H. Bowen School of Law. 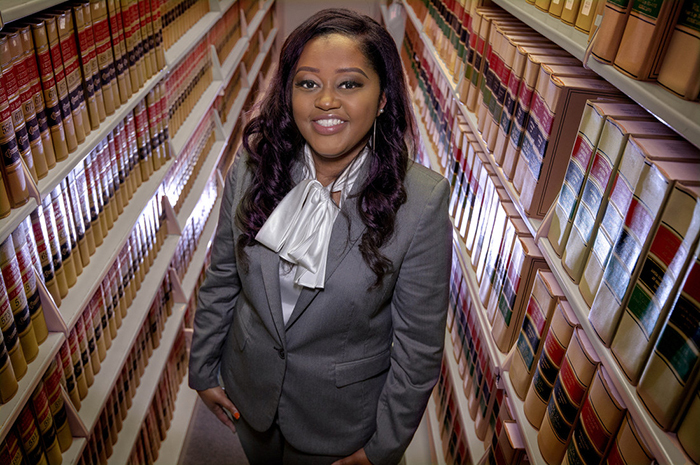 She will take the Arkansas Bar Exam in July and has already secured a prestigious clerkship with the Honorable Lavenski Smith, chief judge of the U.S. Court of Appeals for the Eighth Circuit, beginning August 2019. “It’s exciting because it’s been such a long journey,” Harris said. While Harris, 30, isn’t the first in her family to go to college, she is the first to attend law school. She grew up in Brinkley, the youngest of 11 children. Her parents, siblings, and daughter, will be at commencement in the Jack Stephens Center to see Harris get her degree. Her sister has even made matching T-shirts for the family to wear. After high school, Harris enrolled at UA Little Rock and earned a Bachelor of Business Administration in entrepreneurship and small business management in 2009. That was also the year Harris had her daughter, Naila, who is now a second-grader at Don Roberts Elementary in Little Rock. Shortly before giving birth to her daughter, Harris started the Master of Business Administration program in UA Little Rock’s College of Business. She attended part-time and earned her MBA in 2011. While she was a graduate student, Harris interned with the Department of Housing and Urban Development’s Division of Fair Housing and Equal Opportunity, which investigates housing discrimination claims. “For many years, I’ve always been genuinely interested in the law itself – how it’s made and how it affects this group of people versus that group of people,” Harris said. During her first year of law school, she worked full-time in the Department of Human Services Division of Childcare and Early Childhood Education. For two summers, she clerked full-time at the Arkansas Municipal League, and on May 3, she completed a clerkship at the general law practice firm Gill Ragon Owen, PA in Little Rock. As a student in the Judicial Practicum course, Harris assisted the Honorable Carlton D. Jones of the Eighth South Judicial Circuit, which serves Miller and Lafayette counties. Although Harris completed most of her work remotely, she traveled to Texarkana to help as well. She has assisted with an expungement clinic at St. Mark Baptist Church and assisted attorneys doing pro bono work at the University of Arkansas for Medical Sciences’ free Estate Planning Clinic for cancer patients. This spring, she participated in the Consumer Protection Legal Clinic. She and other student attorneys helped low-income individuals with housing and consumer law issues. At Bowen, Harris has been active with the Black Law Students Association, serving as treasurer for two years. During her third year of law school, she sought membership on the student-run Law Review and served as an apprentice. She researched an area of employment law dealing with mandatory workplace “donning and doffing” – the putting on and taking off of required uniforms – and whether such time should be paid. Her note will appear in a future issue of the Law Review journal. This past year, she has served as the Notes and Comments Editor for the Law Review. In this role, she has worked with incoming apprentices to guide them through the note-writing process and has edited student notes chosen for publication. 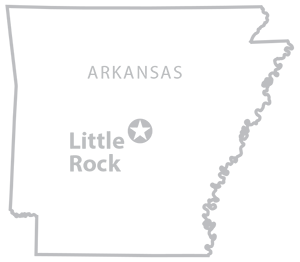 Her experiences have broadened her interests to include employment law, civil rights law, housing law, administrative law, business law, and education law.